If you've never grilled tofu before, have no fear. Grilled tofu is absolutely delicious and very easy to prepare. 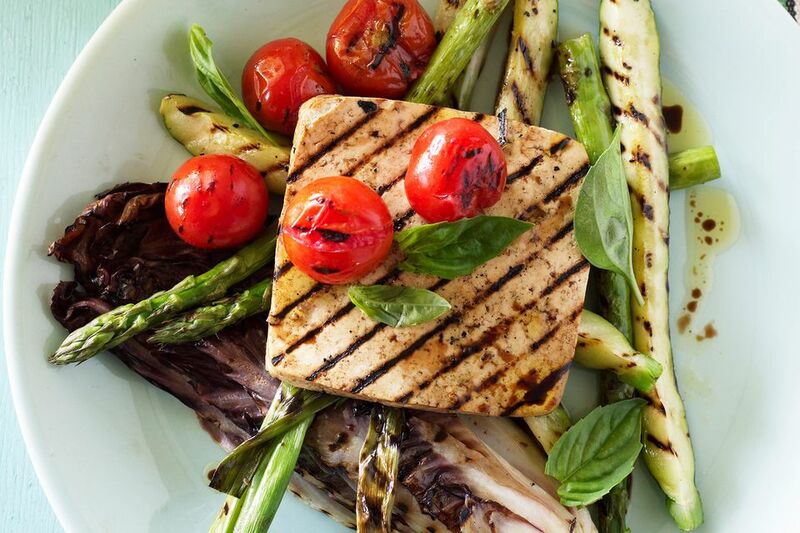 If you're hosting a barbecue, grilled tofu will make sure your vegetarian or vegan guests will have some low-fat, high-protein, healthy, and tasty options to eat. Here are some quick tips to help you have the tastiest grilled tofu on the block. Tofu tends to stick to grills, so prepare your barbecue with a non-stick cooking spray or by rubbing it with oil before grilling. The reason that tofu sticks to the grill is because it's so much lower in fat than meat. Use firm, or if possible, extra-firm tofu, and always press your tofu very well before grilling. This removes a lot of the water that is naturally in tofu and will allow it to grill better. You may also want to freeze and then slightly thaw your tofu before grilling. This will allow the tofu to absorb more of the marinade flavors. Keep the pieces of tofu you plan to grill relatively big. Tofu is delicate, and smaller pieces could end up broken on the grill (and may even fall through the grill grates). If you plan to skewer the tofu, you'll need larger pieces to accommodate the skewers. Marinate your tofu in your favorite marinade for at least 30 minutes before grilling. You can use just about any barbecue marinade recipe that you like, or try a store-bought marinade. If you have a favorite salad dressing that will work well, too. When marinating your tofu, even just a simple soy sauce, barbecue sauce, or vinaigrette will do the trick. A marinade containing a bit of sugar is best, as it will caramelize and help the tofu get nice and crispy and crunchy on the outside. If you are making your own, add a bit of sugar, rice wine vinegar, honey, agave nectar, or maple syrup to your marinade. Try experimenting with pre-flavored tofu in your grocery store. Look for Naysoya brand garlic, and onion tofu or White Wave baked flavored tofu. If you buy these, you can grill them without any marinade or use a very simple one. A strong, flavorful marinade will disguise the taste of the pre-flavored tofu. Unless you're using an indoor grill or grill pan, you may find it easier if you use bamboo skewers rather than placing your tofu right on the grill. If you choose to use bamboo skewers, remember to soak them in water for about 30 minutes before grilling to make sure they don't burn on the grill. Grill your tofu over a pre-heated grill for 6 to 7 minutes on each side, occasionally brushing with extra marinade. The tofu is done when it looks nicely grilled and has crisped on the outside. Unlike meat, there is no way to undercook tofu. Now that you know how to grill tofu enjoy your vegetarian or vegan barbecue. For a full meal, add some corn on the cob, other veggies, or veggie burgers on the grill as well! Once you feel comfortable grilling tofu, feel free to try some specific recipes, including sweet and spicy BBQ tofu, easy barbecued tofu satay with sauce, or tandoori tofu skewers.